An eighth-teaspoon twice a day (or 3 pumps twice a day if using our pump bottle), mornings and bedtime for 24 days and then have a break for 6 days . If symptoms are severe you may increase the dosage to a quarter-teaspoon twice a day (or 6 pumps twice a day), but monitor progress and increase or decrease as required. If at any time you start a period, then stop using the cream immediately and count that day as day one, then start using the cream again on day seven. 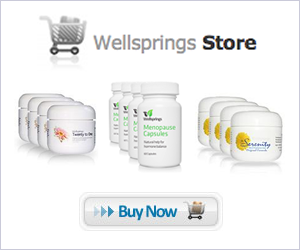 Wellsprings Creams will not bring on a period if your body does not naturally require it. This is the regime recommended by Dr Lee and we have continued to pass this on. However over the 16 years that Wellsprings has been manufacturing and supplying progesterone cream to many thousands of women it has occasionally been reported that symptoms can swiftly re-occur during the 6 day break and once starting on the cream on the 7th day find it more difficult to find relief than they did the first time around. In view of this many women have chosen to ignore the 6 day break and we are aware of many who successfully do this. We recommend that even in these cases an occasional break of at least 2 or 3 days every 2 to 3 months is advisable. Here is what our consulting doctor has to say about it. The reappearance of the symptoms during the 6 day break is not uncommon. It usually means the oestrogen (manifested by hot flushes) and/or the progesterone (weight, mood changes etc from oestrogen dominance) are really low. In this situation your Wellsprings cream raises these hormones to normal whilst applying the cream, the levels fall back down again in the 6 day break. Even worse some women struggle to get any relief during the the 24 days. Applying your Wellsprings cream during the 6 as well as the 24 days often gives relief. I usually advise this continuous therapy for just 3 months, because there is a risk of temporarily bringing back the oestrogen dominance symptoms if the dose is continuous. I usually suggest keeping the dose unchanged. Some women double the dose during the 24 days to a 1/4 tsp twice a day. but once again the OD symptoms may reappear so limitation to just 3 months is advised.